Very fun, Donna & Nnicola. Thanks for the interview! HI Nicola! I LOVE this interview! I do this with my character’s from my books for fun – but I love the answers. Big congrats on the wonderful, and well deserved success – you rock! Thanks Jessi 🙂 And you’re welcome. This is my job now so I treat it as such. When kids are in bed, even though I’d rather be there too I sit down to write. And write solidly for several hours. Do it daily too (except Sundays). The more you write, the faster you become. That’s really interesting you do this for your characters? Must help bring them alive? I agree. Mummy is the best word ever and laughter is the most wonderful sound. Lovely interview, ladies. Thanks! 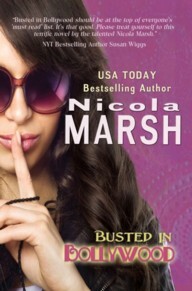 Love this interview because I love Nicola Marsh, well done, Donna! Nicola writes for HQ RIVA too, I have Who Wants to Marry a Millionaire and Tag Team on my TBR pile. Yes, I write at night too and I write every single day because it is a job. I agree, Mummy is the best word ever especially when ‘I love you’ is there first! I got to agree with Politician. I can’t imagine what makes anyone want to do that, even though I think most of them only do it for the money. I mean there have to be easier ways – writing, for example! Well … ok … where do I apply? You’re welcome, Sheila, glad you enjoyed it! Aww…CC, what a lovely thing to say! The Harlequin Romance/Presents/Riva thing is confusing many readers. In the UK my Harlequin books are branded as Riva (I write 2 Romance & 2 Presents Extras a year). In the US, they’re branded as Harlequin Romance and Harlequin Presents Extra. So yeah, I write for Riva. And Rom & PE! lol Nigel. Yeah, writing sure ain’t easy! I truly am amazed at how quickly Nicola writes. However, it proves what I keep hearing again and again: writers have to write to get better! Nicola or Donna, (I don’t know if Nicola is still answering questions) does Nicola still enjoy writing her 32nd book as she did writing her her first five? Also, do you know how Nicola keeps her stories fresh and interesting instead of falling into a standard story line? I wish I was here to read this post earlier in the week so I could have been here when Nicola was still answering questions. I have discovered that when I have my multiple sclerosis flair-ups and I can’t do writing for a day or 2, my writing feels rusty. It was the same when I used to run. I will have to read one of your books, Nicola; especially to fill-in my lack of a love-life! Even though I was not able to write every day this week, I was able to write my second blog post. I would have been upset to miss writing days and not keep to my commitment. I think I’m actually enjoying my writing more now, because at the start it’s all so ‘scary and new’, if that makes sense? Mind you, I still feel like a newbie most days but I’m more confident in the types of stories I write. My editors say I have a ‘fun, flirty voice’ and I have to agree. I have written ‘darker’ stories for Harlequin Romance but it didn’t quite ‘fit’ me. I love dialogue. Snappy, sassy, characters who spark off each other. That’s what I really love writing and I think it flows through my work, whether for Harlequin or Entangled or my YA stuff. And yes, like you, I feel rusty when I don’t write daily. Even taking Sundays off, it’s always harder to get back into it come Monday! What an awesome interview Donna, and quite an exceptional guest. It’s lovely to get to know you Nicola, especially through the fun Inside the Actor’s Studio 30 second interview. I’ll check some of your books out for sure as more and more romance authors are making their way into my blog reading. It must be a sign!